Toshiro Mifune gets the point at the climax of Throne of Blood. A vivid, visceral Macbeth adaptation, the 1957 action drama Throne of Blood, directed by Akira Kurosawa (Seven Samurai), sets Shakespeare’s definitive tale of ambition and duplicity in a ghostly, fog-enshrouded landscape in feudal Japan. As a tough warrior who rises savagely to power, Toshiro Mifune (Yojimbo) gives a remarkable, animalistic performance, as does Isuzu Yamada (Black River) as his ruthless wife. 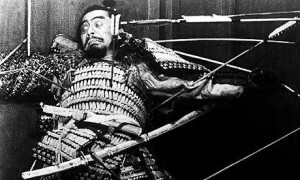 A classic of international cinema, Throne of Blood fuses classical Western tragedy with formal elements taken from Noh theater to create an unforgettable cinematic experience.